A paper by Clark Honors College Dean Terry Hunt and research partners Carl Lipo, Rene Horneman and Vincent Bonhomme, recently published in the journal Antiquity, is receiving a lot of attention. Titled “Weapons of war? 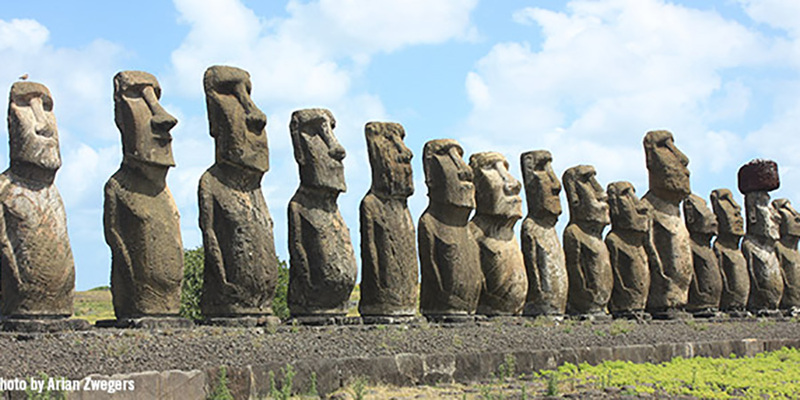 Rapa Nui mata’a morphometric analyses,” the paper presents an analysis of artifacts known as mata'a found across the landscape of Rapa Nui, Chile — also known as Easter Island — that were originally thought to be used as spear points. But research now suggests these objects were likely general-purpose tools involved in cultivation, evidence that runs contrary to the widely held belief that the ancient civilization was destroyed by warfare. A common historical narrative for the small island posits that, after the arrival of Polynesian settlers, the limited natural resources on the island were slowly used up, resulting in too much population, too few resources and much violence and bloodshed. This new paper refutes much of that narrative. The research team analyzed the shape variability of a photo set of 400-plus mata’a collected from the island using a technique known as morphometrics, which allowed them to characterize the shapes in a quantitative manner, and reached their conclusions based on the wide variability in shape of the mata’a and their difference from known lethal weapons. The story has been picked up so far by The Christian Science Monitor, National Geographic, NPR, The Washington Post, BBC, Examiner.com, The Inquisitr News, Science Newsline, Archeology Magazine and many more.